I was given this book as a gift at our baby shower back about a month and a half ago. I finally got a chance to read through it while cuddling and feeding our little guy (who seems to eat an extroadinary amount). 2. Extreme sacrifice and a new mission to give up everything to build a "godly" and "spiritual" home in however the reader might interpret that to look. Home cooked meals every night, by golly! I think, perhaps both would be a misinterpretation of Clarkson's true intent. 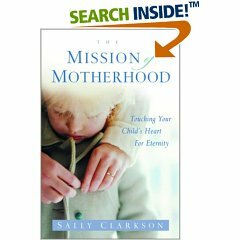 I think the book is meant to challenge mothers to think, not as the world does, but as Christ does. What does this mean? This DOES mean sacrifice. This DOES mean giving up one's own desires for time and personal pursuits in order to redirect that time and attention to one's children. Being a mother means having a servant's heart. It is my opinion that Clarkson didn't mean to "limit" women to the home. She herself is a public speaker and writer so it would be hard to argue that she meant to silence women and keep them confined to the kitchen and laundry room. Although I'm starting to feel like those are my only two "places" in which I am to exist. So sayeth my infant. This book is a good read, no matter what your state and/or "status" of a mother is. I think the thing that I got the most out of was her admission that her attitude isn't always correct. However, it is her attitude that most directly effects the atmosphere of the home. I happened to marry a man who is big on having a cheerful attitude. He happened to marry a woman who has paid little attention to being "chipper" in her young life and is learning to express herself more positively. This book was just another reminder, from a mom who is further along in her journey, that if I'm positive, my home will be too. I would recommend this book in a heartbeat to anyone who asked for a book on motherhood or expressed frusteration with the state. Of course, if one is frusterated this book might not be the best to pick up first, least you wish to hurl it against the wall. Clarkson, as she advises, tends to focus on the positive aspect of her home although she does admit she is not perfect. She doesn't try to paint herself out to be the Perfect Model of a Mother. But I can certainly see how it might come across that way on a quick read through. At any rate, if you are a mother, I'd give this one a chance!